The Mitsubishi WD380U-EST is a new WXGA (1280x800) ultra short throw projector that's different from just about everything else on the market. It combines the capabilities of an ultra short throw projector containing a mirror with the form factor of a standard business projector. The result is a projector that's easy to set up and use while retaining the ability to display a 100" diagonal image from about 30 inches away. It's no one-trick pony, either; the WD380U-EST contains a cornucopia of features, such as a 6,000-hour lamp and wireless networking, that make it a joy to use in any conference or classroom. At $1299, the WD380U-EST is a great value. 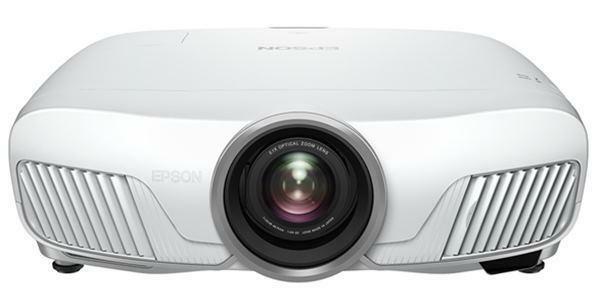 The WD380U-EST is a full-featured projector, suitable for any room where space is a concern. The projector's extensive network capability will make life easy not just for IT departments but also for the employees and staff who have to use it. The WD380U-EST can project over a wired or wireless network using the included software. It can even, with the help of a USB keyboard and mouse, be used to pull up a presentation on the computer in your office, thanks to its remote desktop capability. If that's not your style, you can use a USB flash memory stick to display jpeg images or converted Powerpoint slideshows without the use of any computer at all. This flexible connectivity is especially useful in the workplace, where conference rooms are shared and presenters might choose one method over another based on convenience or personal preference. In a classroom, the ultra short throw capability allows a teacher to stand very near the projected image without casting a shadow. It also keeps the projector up near the teacher, whether on a cart or a more permanent wall or ceiling mount, rather than back among the students. Since the WD380U-EST uses no mirror, the light path is sealed away from dust, scratches, and other sources of harm. The projector's ten-watt speaker is loud enough to be heard throughout a whole classroom, and the WD380U-EST even allows you to use the speakers while the projector itself is off. The audio mix capability allows a teacher to use a wireless microphone with the same sound system, creating a real-time voice over track for any content. The WD380U-EST has an upward throw angle offset of 12%, which is relatively mild. However, the projector's aggressive ultra short throw lens displays a very large image at short distances, which is likely to be the main obstacle to mounting the projector in your room. Ceiling mounts are possible, though of course the WD380U-EST needs to be very close to the screen for this to work. The standard choice for ultra short throw projectors these days is a wall mount, where a metal arm holds the projector just above the screen; the WD380U-EST can be mounted this way as well. Mitsubishi manufactures two wall mounts, the PROJ-SWM ($179) for all of their short throw projectors and the PROJ-EST ($119) specifically for their EST models. The SWM has some special features, such as the ability to swivel out of the way when not in use, while the EST is designed specifically to hold the WD380U-EST and does not swivel. Both have some telescoping capability used to adjust image size, as the WD380U-EST does not have a zoom lens. A rolling cart is also a possibility, though it is sometimes difficult to precisely position the projector when the cart has a tendency to shift slightly during use. Be sure to set the brake. The WD380U-EST is best used at relatively small screen sizes of 80" to 100" diagonal in its native aspect ratio of 16:10--too much larger, and one runs out of focus range. At this size, even bright room lighting is not enough to overwhelm the projected image, though less ambient light allows for the WD380U-EST's contrast and color performance to shine through. Ultra short throw. When you need a big picture in a small space, ultra short throw is where it's at. There are a couple of different types of short throw projector; some need up to six feet of throw distance, while others can work with mere inches. The WD380U-EST is the latter. It is designed for confined spaces and small rooms, and the projector can display an 80" diagonal image from only 26" throw distance. Since the WD380U-EST is styled like a traditional projector, with a lens in the front, it is dead simple to set up properly for anyone who has used a projector before. Sharpness and clarity. Once you've got the WD380U-EST set up properly, it is easy to get the geometry just right so you end up with a straight and level picture that's sharp as a tack. Every corner of the projected image is in focus despite the projector's extreme lensing. There are no problems with barrel or pincushion distortion, either; the picture is exactly rectangular. Light output. The WD380U-EST is rated at 2800 lumens maximum, but our test unit measures 3249 lumens in Presentation mode with the lamp at full power. Presentation mode emphasizes pure contrast and is recommended for black and white content, but color saturation and shadow detail are almost nonexistent at this setting--it's not very subtle. Standard mode has a far more balanced picture, though light output drops to 2573 in exchange for that balance. Educators will appreciate Blackboard and Whiteboard modes, which tailor the image for projection on surfaces which often have to serve as makeshift screens. These modes produce 2366 and 1315 lumens respectively. Whiteboard mode's lower light output is tailored for the intended application, since whiteboards are reflective and too much light leads to uncomfortably bright hotspotting. The last image mode is Theater, with the best shadow detail of the bunch and a warm color temperature preset that is a good choice for movies. This mode produces 732 lumens. While the WD380U-EST is not a home theater projector, the Theater preset makes movies look better than one would expect from a business projector. Presentation mode with the lamp set to full power did indeed exceed the published specification handily. There is an explanation for this, though. Consider how a projector's brightness is measured - readings are taken from a meter positioned at the screen's surface. Part of that meter is "seeing" straight down into the projector's lens. This does not create a discrepancy for most non-short throw projectors, since most of that light is bounced back towards the audience. However, in an ultra short throw projector some of the light is reflected onto the ceiling rather than back to the audience. Kudos to Mitsubishi for not inflating their published specifications even when they had justification for doing so. Low lamp mode, which doubles lamp life, only reduces light output by about 20%. Since the WD380U-EST has lumens to spare for most applications, many people will want to use Low lamp mode for the additional cost savings. Sealed light path. The WD380U-EST does not use an external mirror as do many ultra short throw projectors. A mirror allows a projected image to be made larger in a confined space, but it opens up a portion of the light path to the outside world. The problem here, Mitsubishi says, is that this makes critical portions of the projector more vulnerable to damage. The only vulnerable part of the WD380U-EST is a small rectangle on the lens not protected by the plastic shield, and there's no chance that the lens can be knocked out of alignment like a mirror could be. Maintenance. When it comes to maintaining your projector, the WD380U-EST makes life easy. Standard lamp life is 3,000 hours, while Low lamp doubles this to a whopping 6,000. There are no air filters to clean or replace. The lamp replacement door is on the top of the projector, so ceiling mounted units can be serviced in place. Replacement lamps cost $199 direct from Mitsubishi, so the WD380U-EST can be inexpensive to maintain. Extensive networking. The WD380U-EST has a built in RJ-45 LAN port, but it can also take a wireless adapter ($49) that eliminates the need for wiring--a must in mobile installations like the ubiquitous rolling cart. The WD380U-EST can do all the standard tricks, like report its status back to a tech support or IT department over the network and allow presentation over the network with the use of special software. But it also has a new trick that we have not seen before. By running the included software on your PC, you can not only control the projector from your computer--you can control the computer from the projector. Attach a keyboard and mouse to the WD380U-EST via the USB ports and suddenly you can control your PC remotely, allowing you to use the desktop in your office to present in a meeting room elsewhere in the building. While most people have laptops these days, it's nice to be able to leave it behind. Connectivity. The WD380U-EST has a wide variety of connections to choose from. The rear panel is full without being crowded, and a color-coding system lets you see at a glance which port you need: blue for input, orange for output. For video, the WD380U-EST features HDMI, two VGA ports, a VGA monitor out, composite, s-video, two USB ports, and a LAN connection. The USB connections are not redundant; they are actually two different inputs. You can use a Windows PC and just a USB cable or you can use a USB flash drive and go PC-free. Slideshows need to be converted ahead of time using included software, but jpeg images can be played directly. For audio, the projector has a pair of L/R RCA stereo inputs, two 1/8" jacks, and a 1/8" audio out, as well as audio over HDMI. Data is handled by a 9-pin serial port and the wired and wireless network capability. Audio. The WD380U-EST has a ten-watt speaker, which is not unusual. What is unusual is how it can be used to mix different audio sources, such as a movie's audio track and a presenter's voice. What's even more unusual is how it can be used when the projector is powered off. You can't adjust the audio mix balance while the projector is off, though. 3D. The WD380U-EST is DLP-Link 3D enabled, so you can use a PC to send the projector a 120Hz 3D signal and it will be displayed properly fir viewing with DLP-Link active shutter glasses. Note that DLP-Link 3D is not the same thing as Blu-ray 3D, and you cannot just hook up a Blu-ray player and have it work without adding an external converter box. This feature is aimed primarily at educators and businesspeople who have a use for 3D presentation, not 3D gamers (the projector is not on NVIDIA's 3D Vision compatible list) or those looking for 3D theater. Low fan noise. High lamp mode does produce a good bit of noise, with a whooshing rush of air during use, but it is not high-pitched or unusually distracting. However, even at 2567 lumens, eco mode is almost silent. Since ultra short throw projectors tend to be popular in tight spaces, having a low-noise, low-exhaust lamp is a good way to keep the audience comfortable. Warranty. The standard warranty on the WD380U-EST covers the projector for three full years, plus express replacement during that time (a must for business). The lamp is covered for a year or 500 hours, whichever comes first. This level of coverage is a major plus to institutions, since they typically buy many projectors all at once. As your sample size goes up, so do the chances of getting a dud. When that happens, you're covered. Focus lever is wobbly. The one thing that is absolutely critical on a short-throw projector is focus. Ultra short throw projectors tend to be finicky when it comes to perfect focus, and even a slight misalignment can make the picture look a touch softer than it ought to. While the WD380U-EST has no problems with edge to edge sharpness, it does have a more mundane issue. The focus lever feels loose and wobbly, so adjusting back and forth can be frustrating at times. Obviously this is not much of a concern in a fixed installation, but a projector on a rolling cart would need to be focused every time it is moved, thereby amplifying the annoyance. Remote. Some remote controls are intuitive from the get-go, but the WD380U-EST's remote isn't one of them. It feels cluttered, with lots of tiny buttons labeled with equally tiny lettering. While I have used a remote control or two in my time and am generally pretty quick about picking up the layout, my thumb kept punching "A/V Mute" instead of "Menu" since the two are in close proximity and approximately the same size. That got old very quickly. The Mitsubishi WD380U-EST is highly capable. From its unique lensing to its robust connection panel, the projector seems to have an answer for everything. Its long life lamp is a boon for schools and businesses trying to save a few bucks, while its network capabilities are tailor-made for busy conference rooms. The image presets are sensible and useful and do not require a lot of adjustment. Fan noise is low, while the 10W speaker is loud and the new audio features work without a hitch. The focus adjustment is a little sticky, and the remote could be improved, but overall the WD380U-EST is a rock-solid projector that we have no problem giving our highest recommendation. If you need a big picture in a little room, this is your answer. What is the lumen output expected at 6000 hours? I think that short throw projectors offer tremendous potential in the home also. The new short throw Mitz 380 seems like a better alternative than the Optoma GT-720 for those who are interested in a Pj that can be use for both gaming and home movies - Is this the case?